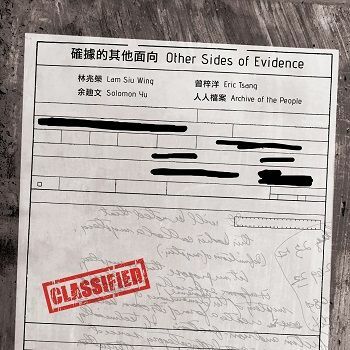 Osage Art Foundation is pleased to announce the exhibition titled “Other Sides of Evidence” curated by Solomon Yu, featuring the works of local art practitioners Lam Siu-wing, Eric Tsang, Solomon Yu and the art group Archive of the People who will present their artworks as a way to explore the relation between truth and art creation. The exhibition will open on Feb 6, 2017 at Osage Hong Kong and an on-site public forum will be held on Feb 25, 2017. Generally we believe that facts and evidence help establish the ‘what-has-been’, yet they are not accountable for a truth. The burdens of facts and evidence are in fact multifaceted. In recent years, ‘what is real’ or ‘what is the truth’ has become a popular enquiry, covering topics ranging from real universal suffrage, real childhood, mockumentaries, reality TV, to realities and truths presented by the algorithm behind social media and search engines, and lately, Oxford Dictionaries’ word of the year 2016, ‘post-truth’. If we see ‘evidence’ as data just obtained, then it is worth exploring what else they could answer besides a truth. While people demand the truth about things and appreciate realness in life, as creative agents we artists also explore aesthetic truths. We research our subjects and then make use of the findings to create fictions, poetry, alternatives, new knowledge, even interventions that simultaneously redress real life. “Other Sides of Evidence” will present different responses from participating artists to these parallel roles – bearing responsibility for inquiring and observing reality and the truth, yet exercising our license to make believe and create. Courtesy of the artists and Osage Gallery, for further information please visit www.osagegallery.com. Institute of Contemporary Arts Singapore presents "ILLUMINATIONS: Taiwanese Media Art"